Eleven years after the demise of the Oscar winning director and awardee of the Bharat Ratna, Satyajit Ray's movies are as popular as ever. Like all Bengalees I grew up watching his movies. I was settled abroad till I was 7, yet I had seen all his childrens' movies before returning to India. Gupi Gayen Bagha Bayen was the very first Ray movie I watched. As a three year old child maybe I should have been frightened when Bhuter Raja (the King of Ghosts) grants a boon to the naive albeit adorable heroes Gupi and Bhaga. Instead I had great fun listening to the ghosts singing a catchy nasal jingle and asked my parents to play that scene over and over again on video. Before long I had learnt all the songs of Gupi Gayen Bagha Bayen and Hirak Rajar Deshe. NRI children sometimes complain that they feel uncomfortable when Indian culture is imposed on them by their parents. But I never felt that way when I watched Ray's movies, they were so typically Bengali yet so universal, I could easily identify with them. Little wonder then that he had won the Honorary Academy Award for Lifetime Achievement for his excellence in 'humanistic approach to cinema'. "His orchestratian of colour is painterly ... colour is not mere embellishment. It has greater purpose; it has identity." "What is wrong about showing India's poverty ? Everyone knows that we are a poor country. The question is : are we Indians sensitive to our poverty or insensitive to it ? 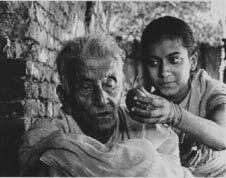 Satyajit Ray has shown it with an extraordinary sense of beauty and sensitiveness." "Ray knows exactly what he wants. He has experience in western music, particularly the piano." Satyajit Ray was born on May 2, 1921 in an artists' family. His grandfather Upendra Kishore Roychowdhury was a renowned writer, painter and musician. His father Sukumar Ray was the father of Bengali "nonsense" literature writing in the tradition of Lewis Caroll and Edward Lear. Though Satyajit Ray had been born in an affluent family, he had never known a life of luxury as he lost his father when he was only three years old. Before long his mother had to move out of their spacious house with him. His mother taught needlework to make ends meet. Later in life, Ray artistically weaved in this autobiographical incident in his movie Aparajita. Apu's mother Sarbajaya is seen busy at needlework simultaneously talking to her dear son. Ray, though an average student at school, was seriously involved in artistic pursuits. He loved watching Hollywood movies and listened to western classical music on his gramophone. After graduating from Presidency College, Kolkata, he went on to study painting at Shantiniketan. In April 1943, Ray joined a British run advertising agency in Kolkata as a junior visualiser and later married his cousin and childhood sweetheart, Bijoya. While illustrating the abridged version of Bibhuti Bhushan's Pather Panchali, Ray felt that it could be made into a very good film. 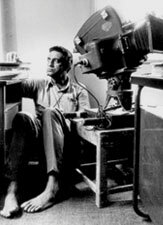 Having written screenplays for his own pleasure, he wrote an adapted screenplay for Pather Panchali. He wanted to make the film Panchali along the lines of his all-time favourite De Sica's Bicycle Thieves - a neo-realist film to be shot on actual locations, with new faces and no makeup. His wife Bijoya's jewellery was pawned to fund the project. Sitar maestro Pandit Ravi Shankar composed the music for the film. Billboards designed by Ray with Apu and Durga running in the backdrop of dark monsoon clouds were all over the city. The movie was a great box office hit and went on to win a special jury prize at Cannes. Ray quit his job at the advertisement agency and became a full fledged director. His two sequels to Pather Panchali - Aparajito (The Unvanquished) and Apur Sansar (The World of Apu) successfully completed the critically acclaimed epic, The Apu Trilogy. Till 1981 he made a feature film every year. Ray radically changed the face of Bengali cinema. Most Bengali movies produced earlier were bereft of artistic merit and far removed from actual reality. No other contemporary film maker could have depicted Kolkata untainted in its misery, squalor, corruption, political unrest, unemployment and despair as Ray had done in his movies Mahanagar Seemabaddha, Jana Aranya and Pratindwandi. As a social critic he opposed superstition in his films Devi, Ghare Baire, Ganashakti and Mahapurush. Shaka Proshaka is an elegy on the decadence of family values. Even his childrens' movies had a social message, without being blatantly didactic or moralistic. Hirak Rajar Deshe and Porosh Pathor tell us that money can corrupt. 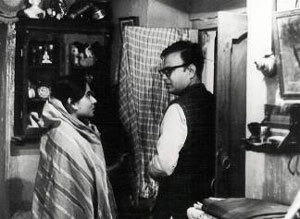 Ray was most probably the foremost male Bengali director who had feminist lead roles in his movies. He had once said in an interview that though women were not physically as strong as men, they were often emotionally stronger. Arati in Mahanagar matures from a housewife to a successful career woman and even goes on to be the sole bread winner of the family. Monisha in Kanchenjunga refuses to submit to an arranged marriage and rejects the suitor her father has chosen for her as she is sure that she can never grow to love him. Karuna in Kapurush proudly snubs her ex-lover before going back to her husband. Aditi in Nayak is a journalist editing a serious women's magazine who carries herself with grace and dignity. Even in movies like Pikoo, Charulata and Ghare Baire, he depicts women who have been unfaithful in marriage, with rare sensitivity and compassion. Most of Ray's movies were family movies. He portrayed intimacy with subtlety and more effectively than spelling it out. But that was what made his films so successful - as much was said in what was not spoken or shown. In Seemabaddha, Ray focuses on the city's clubs and cabarets and Jana Aranya realistically portrays prostitution. Besides being a successful film maker, Ray was an adept writer of fiction and an excellent illustrator. He also made a series of documentary feature films. I never had the opportunity to meet Ray, but I enjoyed talking about him with several people who knew him well. Madhabi Mukherjee said, "It was a great pleasure working with Ray. He was very talented. As there can be only one Rabindranath Tagore, there can be only one Satyajit Ray." Biplab Chatterjee said, "It is every actor's dream to work with a director like Ray." 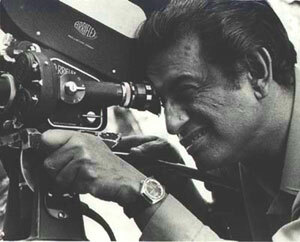 Swatilekha Sengupta said about Ray, "I think Satyajit Ray is the greatest director. He was an introvert. He treated his his actors and actresses with respect. He worked in great detail. For Ghare Baire he actually got hold of towels with Vandemataram written on them. He borrowed an expensive old jewel case of rose and sandalwood and an old jacket of the Swadeshi era. When the jacket fit me, he jumped up and down like a little boy. He would pre-sketch and paint every scene. Everything was planned and well organized." Tapen Chatterjee spoke of him,"Ray was a great man, but not the least bit proud. He used to receive all phone calls himself and personally open the door for guests. Foreign journalists were impressed by his modesty. Charles Chaplin considered him to be one of the five greatest directors of the world." And Subhendu Chatterjee said,"Ray was a supreme person. He read the dialogues so beautifully himself that he inspired us." Ray has had many vociferous critics, who said he depicted the poverty of India in Pather Panchali, Hindu fundamentalists tried to stop the screening of Devi abroad because they regarded it as an attack on Hinduism, Anglo Indian leaders objected to his film Mahanagar. The balance tilts so overwhelmingly in his favour, that he will always be remembered as a truly great film-maker and a remarkable man.